Why has the KC-46A tanked? It’s safe to say that Boeing is having a pretty tough time with its KC-46A programme. In July, the company had to accept a half a billion dollar charge after faults were found in one of the test aircraft’s fuel system. Last year, it had to take a similar charge (around $425 million) after it was discovered the aircraft’s wiring did not comply with the US military’s strict requirements. Can Boeing get its KC-46A programme back on track? So all together, Boeing has been hit with over $1 billion worth of charges on the programme. Why the charges? When the US aviation giant won the KC-X contest in 2011, beating rivals Airbus, it was given a fixed-price $4.9 billion engineering, manufacturing and developing (EMD) contract. This essentially means that any EMD costs that go over that amount, Boeing has to pay, not the US taxpayer. With both wiring issues and fuel system problems being addressed early in the EMD phase, rather than later in the flight test phase, Boeing officials would have been forgiven for thinking that the worst was probably over. But no, earlier this week, a company spokesperson confirmed to me that the first flight of a fully-equipped KC-46A would have to be delayed once again. The reason? A ‘fuel substitute’ labelled as safe to use for fuel system testing had been mislabelled (it wasn’t military compliant) and damaged several parts. While the auxiliary tanks had not been affected, many other parts will have to be replaced or refurbished because of the mishap. The KC-46A is now not likely to lift off until October, around six months later than originally planned by Boeing. That poses several challenges for the US Air Force, which is expecting 18 shiny new aerial tankers on the flight line by August 2017. 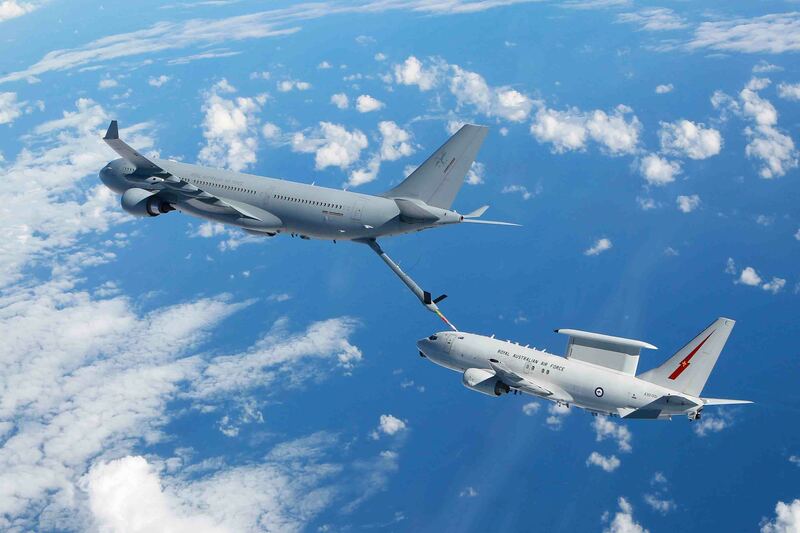 The service wanted to use this year to evaluate and test the aircraft’s in-flight refuelling performance in preparation for a Milestone C decision (giving the thumbs-up for low-rate production) expected early next year. Continued delays have all but eroded that evaluation and testing time, and could force the USAF to rush its Milestone C decision to meet the programme’s aggressive timelines. Boeing has already gone into contingency mode and is producing the first LRIP aircraft, without Milestone C approval. This means the KC-46A is entering the ‘concurrency’ zone, meaning flight tests and initial production overlap. What happens if a fault is found during flight tests? Those LRIP aircraft already been put together on the assembly line have to go back and be retrofitted, driving up costs and delaying deliveries. The best (or worst) example of that today is the F-35 Joint Strike Fighter, which has made ‘concurrency’ a dirty word in defence procurement. Can the KC-46A go the same way as the F-35? It’s not likely for several reasons. The main one being that the KC-46A is, after all, based on the 767-200 airliner that has been built by Boeing for decades. There are also several 767 tankers already in operation – Japan and Italy are two countries that operate 767-derived tankers developed by Boeing – which means the concept is more than achievable. Once issues involving the fuel system are finally ironed out, and no major design/manufacturing issues are found during flight tests, there’s a good chance that the programme will get back on track and start making money for Boeing. The company is expected to deliver 179 tankers to the USAF by 2027 to replace part of the ageing KC-135 fleet, and officials believe the market potential could be up to 400 aircraft worth $80 billion. Though that might just be restricted to the US market, as all international contests so far have resulted in wins for Airbus’s A330 MRTT. As Boeing’s woes continue, one can imagine the smug faces at Airbus as they notch up more MRTT orders.